Cemeteries, no. 23: the Taylor-Barnes cemetery. Deborah Webb sent the tip a month ago — there was an abandoned graveyard off Webb Lake Road that contained the remains of an unknown African-American family. After my library talk Tuesday, I got some additional directions, and yesterday morning I set out it find it. L. and T. Speight gave permission for me to park in their driveway and pointed out the copse out back. Standing in the middle of a turned-under corn field, such a stand of woods is a tell-tale sign of a cemetery. It was a fight getting in. The smilax is ferocious. Breaking through though, I could see unmarked, subsided graves across the forest floor. I saw no headstones, and only two graves bore small metal funeral home markers, meant to be temporary. The paper inserts identifying the dead were long gone. Toward the back, there was a single vault. Its concrete and brick cover had collapsed at one end, exposing the interior. I did not disturb it to search for a name. Mr. Speight told me that the graveyard had been there when his grandfather bought the farm in 1938, that the last burial had been more than 30 years ago, and that he thought the family was named Barnes. Wilson County Genealogical Society has published several volumes of transcribed cemetery records. I didn’t have access to my copies, so I consulted Joan Howell, the tireless spirit behind the project. She called me back this morning with an ID. This is the Aaron Barnes cemetery, first surveyed in 1991. It was overgrow even then, with only the vault and two metal markers visible among the 33 identifiable burial sites. 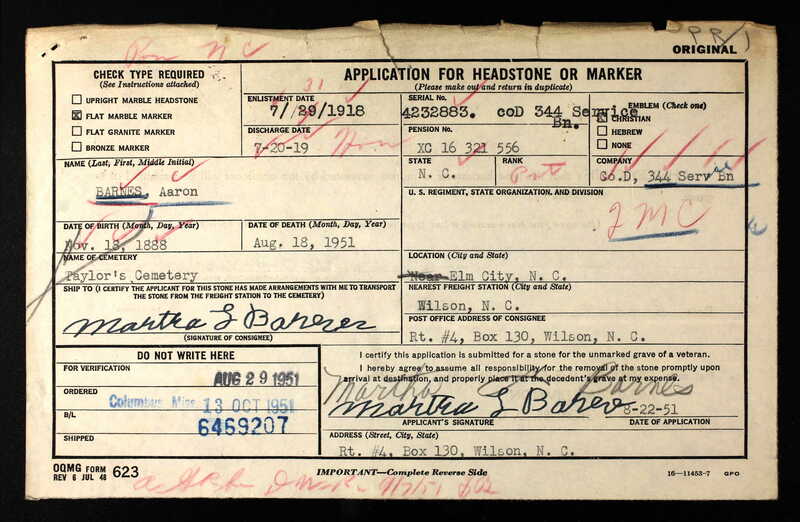 Two graves bore names — Aaron Barnes (1888-1951) and Pattie J. Taylor, who died 3 January 1953 at age 16. Theirs was a late marriage. 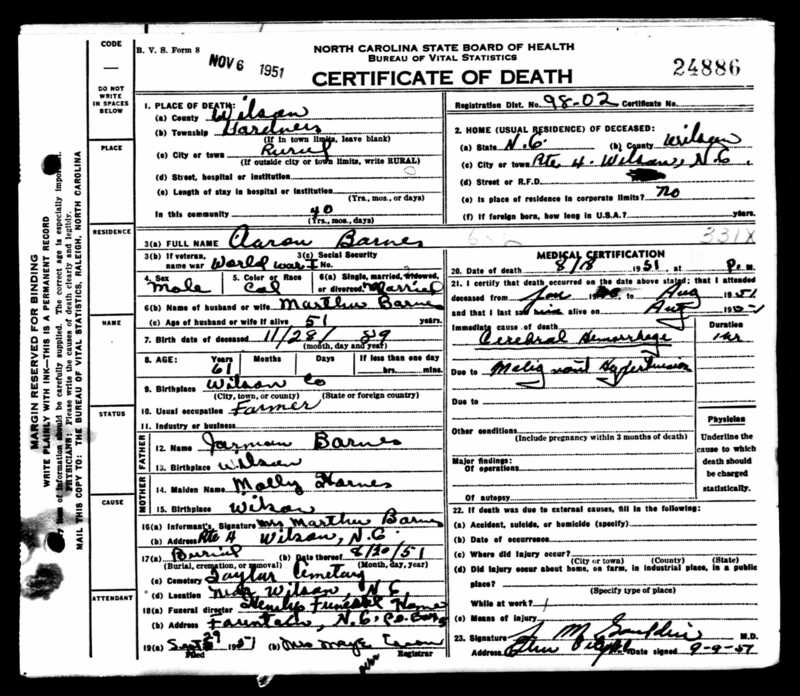 Aaron Barnes, 50, of Gardners township, son of Jarman and Mollie Barnes, married Martha Lancaster, 38, of Gardners, daughter of John D. and Susan Lancaster, on 3 November 1938 in Wilson. Photographs by Lisa Y. Henderson, February 2019. Many thanks to Deborah Webb, L. and T. Speight, and Joan Howell. ← In memory of my husband. Your research is relentless and so interesting! You’ll read a cemetery scene in Half-Truths. It was inspired by a true story (I’ll tell you more after you read the manuscript–don’t want to give it away!) as well as finding out about this cemetery in Charlotte. http://www.thecharlottepost.com/index.php?src=news&refno=4071&category=News. It’s in the middle of the affluent South Park area. See this too:https://saintlloydchurchcemetary.wordpress.com.